In the aftermath of the First World War and the subsequent collapse of the Austro-Hungarian Empire, the Austrian government eventually managed to secure financial aid from the League of Nations in September 1922. This led to the foundation of the Austrian Central Bank, the first major step in Austria’s economic reconstruction programme following the debacle. In December 1923, the Austrian parliament authorized the issue of silver coins at a denomination of half schilling, schilling and double schilling, while the first schilling note was issued two years later at a denomination of 100 schillings. Coins and notes of all denominations were to follow and, in time, Austria’s strict hard-currency policy saw the schilling evolve into one of the most stable currencies in Europe, earning it the nickname ‘Alpendollar’. Despite its replacement by the German reichsmark during the Second World War, the schilling’s exchange rate link to the US dollar in 1953, following Austria’s successful monetary reorganisation, paved the way for the country’s membership of the International Monetary Fund. The Central Bank kept the value of the schilling stable by opting for a hard currency policy, which resulted in the tying of the schilling’s exchange rate to the Deutsche mark from 1976 onwards. By constantly adapting to changing market conditions, by the early 1990s Austria had achieved a high degree of monetary integration within the international economic community and the schilling enjoyed stability until it was eventually replaced by the euro in 2002. The Oesterreichische Nationalbank (OeNB) will still exchange unlimited amounts of schilling banknotes and coins of the last series into euro for an unlimited period. The exchange rate is 1 Euro = 13.7603 Schilling. 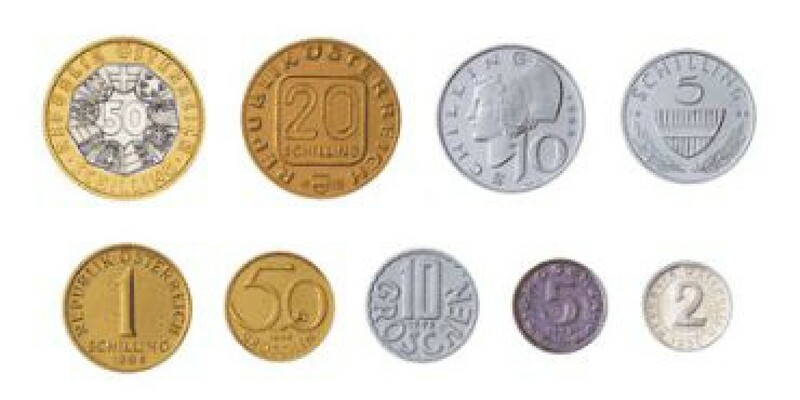 In addition to the Schilling circulation coins pictured here, the OeNB also exchanges all silver Schilling coins issued from 1955 to 2001 at their face value (ATS 25, ATS 50, ATS 100 or ATS 500). Please note that depending on the current silver price, Schilling silver coins may sell at higher prices at professional coin dealers.